This is a long personal rant that most of you may find TL;DR. Feel free to skip it, or feel free to read it and enjoy a walk through my tumultuous past with Ubuntu. If you have been reading posts on this blog you already know that it has been quite some time since I gave up on Ubuntu. The last Ubuntu release that I had installed on ALL of my computers at home was probably 10.10. Then, Ubuntu announced a lot of changes so I switched to Fedora (verne) on most of my home systems. But, I have always found Fedora, and Redhat, a bit weird. Add to that the fact that I had a bunch of scripts that I used frequently to manage my Ubuntu systems, from package updates to package listing and everything else. But, more than anything else I missed the Ubuntu community. I feel that, as a Linux distro, Ubuntu’s biggest achievement was the creation of a wide (and very helpful) fan-base around something as trivial as Linux. I say trivial because for people who have been using Linux for some time now, there were always newsgroups and mailing lists. But, Ubuntu’s web based “knowledge management system” (the wiki, askubuntu, etc) combined with, numerous Ubuntu-focused blogs that seem to crop up out of the blue made Ubuntu interesting. Add to that Google’s fantastic search engine, and Ubuntu’s popularity was guaranteed. Way back in late 2004, a young engineer “gifted” me a whole bunch of Ubuntu CDs. All I could say was “OK! Thanks!”. That night, at home, I installed Ubuntu on an ancient Thinkpad 600E. Without a doubt, Ubuntu was very easy to install, but, then almost 5 years earlier I had installed Mandrake Linux on that same notebook. And my thought/feeling was that Mandrake Linux felt far easier ages before Ubuntu came on the scene. Bottom line: Ubuntu’s ease of installation didn’t impress me. That night, after playing with Ubuntu for about 2-3 hours, I realized that Ubuntu wasn’t bad, but neither was it as great as most of my colleagues wanted me to believe. Ubuntu felt like a decent Debian based distro. Oddly enough, I continued to install and use Ubuntu on all of my systems at home. But, I was NEVER happy with Ubuntu. And the fundamental reason was all the useless packages that they were pushing, or rather FORCING, on to the users. I don’t like people pushing useless pieces of code onto me. And Ubuntu pushed and peddled a lot of useless, open source, crapware onto its users while leaving useful and essential packages out of the distro. And all along, while pushing this bad-ware onto us, Ubuntu did not include essential-ware like compilers and build-tools on their CDs! Or codecs!! You had to download and install the build-essential tools and restricted-extras!! But you had access to absolutely useless pieces of software like Tomboy, Gwibber, UbuntuOne and other stuff that I am fairly certain a VERY SMALL portion of Ubuntu user’s actually found useful. It’s one thing to say that “you may find the following pieces of code interesting and useful” and its a completely different matter to actually go ahead and just install useless software onto a user’s system. But much worse than those useless software packages was the horrid package dependency tree that required you to uninstall the ENTIRE operating system if you attempted to uninstall a seemingly trivial package! Realize something: if/when Microsoft installed crapware onto our system, we all – you and I – would be up-in-arms against the 800 lb gorilla from Seattle, WA. But, in Ubuntu’s case … most people seemed to be praising Canonical for peddling useless pieces of software while leaving useful pieces off the distro-CD. In spite of all my complaints, I continued to use Ubuntu on almost all of my home computers for a L-O-N-G time. There was always one or a few old laptops dedicated to trying out weirdo Linux distros, but, most of my laptops at home ran some version of Ubuntu. But, by Ubuntu 10.10, things were getting unbearable. Unity and Compiz were well set to make their way onto Ubuntu. And compiz kept crashing on my systems. And Ubuntu had a hard-time supporting hardware devices as trivial as 10-year old Ethernet chipsets, and Wifi and built-in cameras. Even worse, the “social” features were getting tightly integrated into Ubuntu for reasons that I did not understand. Even worse, trying to remove the stupid “social indicators” like “you got mail” or “your FB friend is trying to bother you” meant a complete system uninstallation. So, in stead of pulling out my left-over hair, I decided it was time to find a different Linux distro. So, in late 2010 … part ways with Ubuntu … I did. Somtime in late 2010 or early 2011, I ran back to a distro I had used quite extensively in earlier life: Redhat. But, I never really liked Redhat. For an unknown reason RedHat never felt like a distro for human beings. RedHat always felt snobbish. Ubuntu’s community made Ubuntu the “Linux distro for human beings.” But, I didn’t want to use Ubuntu any more … and I wanted to try GNOME 3.0 … so Fedora seemed to be the best option. I loved GNOME 3.0. I still do! In fact, I have an old Lenovo 3000 v100 running Ubuntu 13.10 minimal with all GNOME 3.x additions. I feel that GNOME 3.x is a nice departure from the usual Unix/Linux desktops. And I feel more people should contribute to the GNOME 3.x development to make it stable, leaner and overall better. Within about 3 weeks of starting to use Fedora Verne I knew that I really needed a Debian based distro. And that is how my my search led me to my current favorite distro: Xubuntu. Sure, I still had to download the compilers and build-tools on Xubuntu, but that was a “hangover” from the parent (Ubuntu). And sure I still had to download the codecs and what have you, but that was because of the bad decisions the parent (Ubuntu) made. But most importantly Xubuntu felt like Linux, not a lame attempt at copying of some fruity, feline operating system that Ubuntu was trying to be and failing miserably. 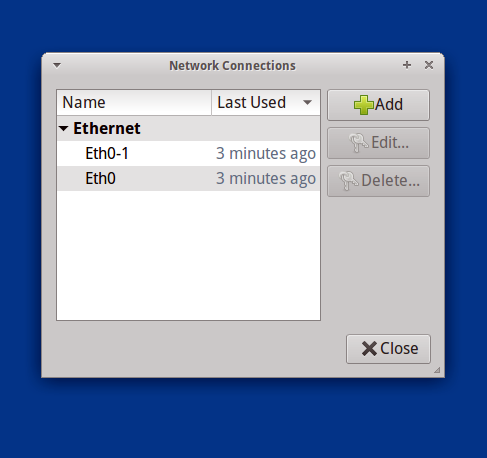 Add to that the fact that most of my scripts from the Ubuntu days worked flawlessly on Xubuntu. And most importantly, I once again had access to the fantastic and helpful Ubuntu community. So, that was that. Back in Oct 2010 I severed my ties with Ubuntu. And then sometime in late 2011, I established ties with Xubuntu. And I have been using Xubuntu on all-but-one of my home systems for the past 2-3 years without any significant complaints. For all practical purposes, I had completely forgotten Ubuntu. And I would have never thought of it if Ubuntu hadn’t sneaked up on me the way it did a week ago. So, a week ago, I got myself a new laptop. At the time of ordering, I knew it did not have any version of Windows on it … which was the reason I bought it … but at least in India, the “cute” thing most of these PC vendors do is that they install FreeDOS on the system when they send it to you. Not the company which made my laptop! 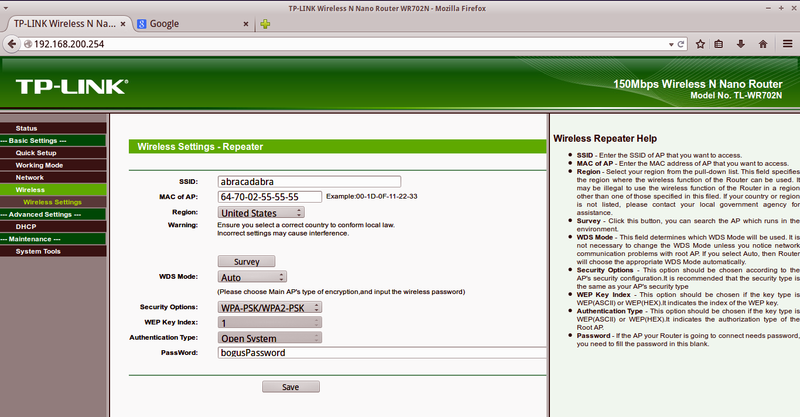 Or at least not that reseller from whom I bought the laptop. My new laptop came with Ubuntu 12.10 LTS!! Imagine my shock when I started the notebook and it said “finalizing Ubuntu“!! I was like “no! no! no! what the heck are you doing? nobody installs ubuntu in my house …” but, before I had finished uttering those words … in my head, of course … the laptop was happily smiling at me, asking me for login information. I figured what the heck, why not give it a try … so I logged in and looked around. And lo-n-behold, a lot of the complaints and the bitchin-n-moanin I had done as an Ubuntu user seemed addressed in that release!! I don’t know who did it: was it the hardware manufacturer or was it Canonical/Ubuntu. But, the Ubuntu installation on my new laptop did not have Tomboy or Evolution or Gwibber or all the useless social integration. It had UbuntuOne, but, I purged it even before that piece of software could say a word. There was that ugly Unity interface, but, I could live with it. Unfortunately, the application menu (file, edit, view, etc) still shows up in the top bar. And because of that, there’s no way to switch the “x  _” window control buttons from left to right because … the application menu still shows up in the top bar. How idiotic is that? Who puts window controls in the top bar other than some tooty-frooty, lame, unncessarily high priced operating systems named after feline species? But, you know what … just the absence of all that crapware (Tomboy, UbuntuOne, Gwibber, Evolution, etc) and a saner package dependency tree in Ubuntu 12.04 LTS made me happy. Just to give it a hard time, I purged avahi. Without complaints Avahi was gone from my system. I tried to uninstall a few more packages (cups, anyone?) and still no complaints. I was “almost” impressed. I tried uninstalling a few apps (Thunderbird, etc) and thankfully, the package manager did not suggest that I should try a different distro like it used to in earlier days. 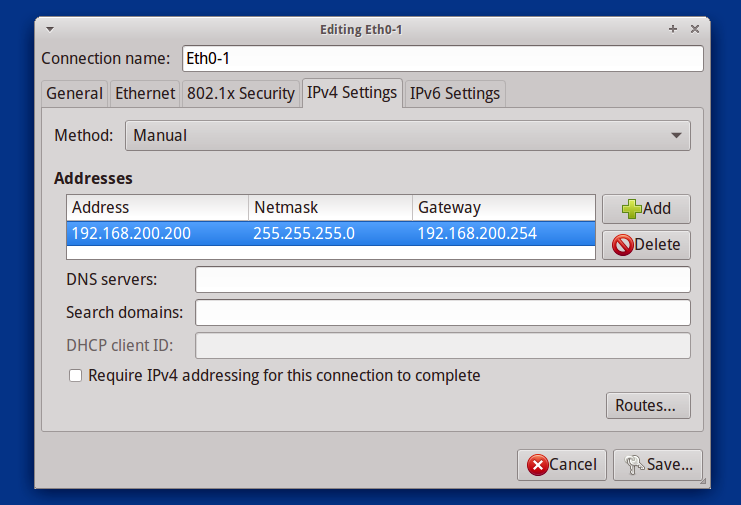 So, after playing with Ubuntu 12.10 LTS on my new laptop for about 2 hours, I was pleasantly surprised. Surprised because Ubuntu seemed to have taken some feedback … not necessarily from me … but from a lot of its users and purged a lot of the crapware and cleaned up the package dependency tree. Yes, Unity was still around, as was Compiz … but, then it is never easy to convince people to do ALL the right things. I attempted a system update from 12.10 LTS to 14.04 LTS but things seemed to break at first. Some editing in /etc seemed to fix a few things, but, I am not sure what else is broken at this point in time. On the whole the system seems to work fine. For an unknown reason this Ubuntu feels OK to use. I may actually use this Ubuntu installation for some time before I install Xubuntu on that new system. Bottom line: I am going to play with my old friend “Ubuntu” for some more time. All I am hoping for is that my old friend (Ubuntu) doesn’t remind me all over again, all the reasons I had to hate it: like useless packages and even worse, a broken dependency tree that required you to uninstall the operating system or live with all the crapware. Kudos to the Ubuntu team on FINALLY producing a decent enough Debian based Linux distro. 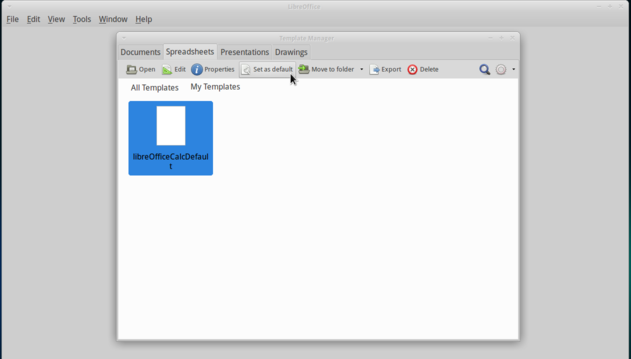 LibreOffice (henceforth referred to as LO, in this post) is a decent piece of software. I think what makes it better is the price: free. But, LO is also a VERY FRUSTRATING piece of software. Or at least I find LO very frustrating. I mean, things that a user should be able to do quickly and easily have to be done in a round about way. Till about 3 months ago, the only reason I would invoke a spreadsheet (typically Excel, which was the only reason I would need a Windows and an Office licence) would be to create a pretty-chart to insert into a document or a presentation. Other than that I was blissfully ignorant of all the cool things Excel and other spreadsheets could do although frankly the real reason was that I didn’t care that those spreadsheet apps could do so much. So, that was that … till about 3 months ago. Then, about 3 months ago, I “discovered” the power of spreadsheets. (Now you know I have been living under a rock for a LONG time, right?) And I instantly fell in love with them. My current understanding is that spreadsheets are great not only for creating pretty-charts from cooked-up data, but, they are also good for routine calculations. With a spreadsheet you don’t have to worry about “how am I going to read that data into my program”. Why? Because you work with the data … directly. Your program is specified as a bunch of formulas that you insert into various cells where you want some calculations done. And most of these spreadsheets, but, especially Excel, come with an extensive library of functions you can use to manipulate your data. Pretty cool, isn’t it? Now, all that sounds great and works well, but, there’s one big problem in Linux-land. No, the problem isn’t that there’s no good spreadsheet software. 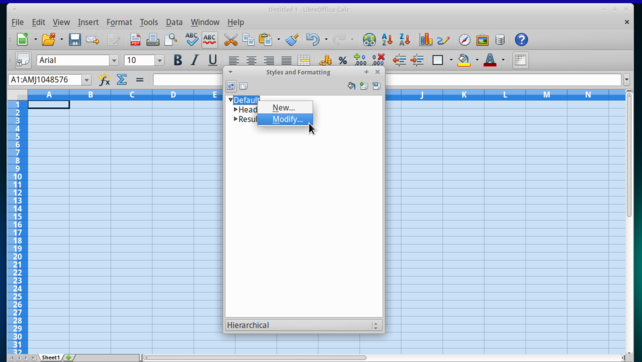 In fact, if you search online you would find a lot of open source spreadsheet software for Linux. The problem is that none of that spreadsheet software is as “nice” as Excel. LibreOffice Calc comes pretty close to be being “nice” but it is like using Excel 1980 rather than using Excel 2013. Why do I say that? Because even a simple function like “set default font for ALL my spreadsheets … now and in the future” is absent. And the developers seem to have no intention to provide that function for whatever philosophical reasons. 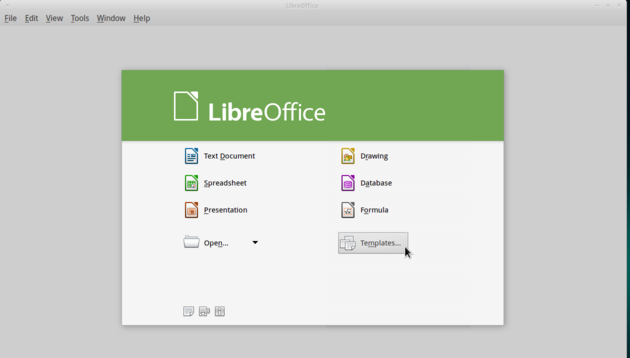 Mind you, we are talking about LibreOffice 4.x here, not LibreOffice 0.04. So, anyway, I googled around and did not find any workable solution for my little problem of “set default font for ALL my spreadsheets … now and in the future” in LibreOffice 4.x Calc. There were things like: create a default template (how?) or choose File->Template (not there in LO 4.x), etc. So, I figured I would try my own trick. And luckily it worked, so here it is for my future reference. If it helps you, all the better. First, I created a new, empty spreadsheet file. Then, I chose “Format->Styles & Formatting …”. Then I right clicked the “Default” list-member and chose “modify”. 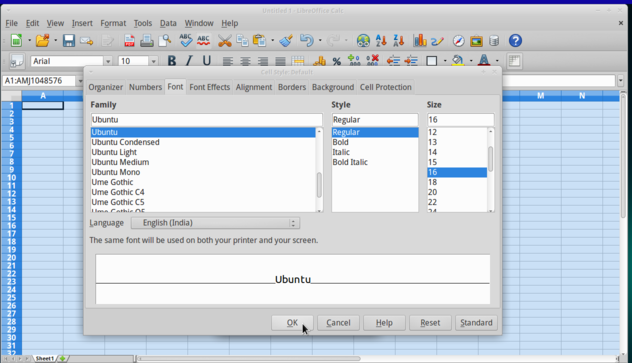 In the Font tab, I chose to set my font to “Ubuntu, size 16”. Yeah! I like B-I-G fonts. Change the default font. I like B-I-G fonts, so I chose “ubuntu font, size 16” as shown here. With that done, I chose to save this file as a “template”. I called it “libreOfficeCalcTemple”, although LO added an ots extension to it. This file was saved in “~/.config/libreoffice/4/user/template/” directory which has been set as the default path where LibreOffice 4.x would save its template files. Now, under ordinary circumstances, I expected that a new invocation of LibreOffice Calc would automatically pick up this spreadsheet template from the default path. But, NOPE! It didn’t even recognize that spreadsheet template’s existence. What gives? I don’t know! And frankly, I don’t care. From there, I clicked the “SpreadSheets” tab, and chose to import my “saved” template. Once my template showed up, I chose “Set default” to make that my default template. Set your chosen template as the default template for all your spreadsheets henceforth. Once all that was done, the next invocation of LibreOffice 4.0 Calc came up with “my” font specification. The point here is that for something as trivial as “set default font for ALL my spreadsheets … now and in the future” I had to jump through infinite hoops (create template file, save it, pull it up again, set it as default, etc) which I feel is unnecessary trouble. So, my humble request to the LibreOffice devs: please set your “high” philosophies aside and create a piece of software that is easy and fun to use. We don’t want a Microsoft Office replacement. We just want a functional, fun and easy to use “office” software. Because if we really wanted to do something the hard way we would all just move to Emacs (JK. BTW, that’s coming from a guy who has used Emacs EVERYDAY for 5+ years … but just used … never really written any Emacs extensions). Anyway, so if that tip helps you, all the better. If not, ignore my rant. wget and curl are two fantastic utilities to grab content from the Interwebs. In their simplest forms, both these utilities allow you to download publicly available files from web sites. In reality, each of them is a very complex beast that you would have to learn and practice for a very long time to claim any level of mastery. Point being, we are not here to teach/learn either wget or curl and all their intricacies. There are lots of blog posts, web pages and web sites that teach you how to master wget and curl, so we will leave all that teaching to those posts, pages and sites. What I want to demonstrate here is an interesting problem I faced today. So, I use wget fairly regularly to download content from the web that I like to read later. As I mentioned earlier, all the content under consideration here falls into publicly available and publicly accessible files on various web sites. If you are point-n-click fan, then you can choose to right-click on a particular link and then choose to save it. That is too much of a trouble for me. I like to “automate” things. 🙂 So, I just make a note of the complete path to the file and save it. Then, I add wget in front of the complete paths of all those files I want to save for later reading, and save all this as a simple shell script. Finally, just before going to bed, I run that download script containing wget followed by comlete URLs of files I want to download. Within a few moments all the files that I need are downloaded, without me having to right-click and choose save … a million times. Now, is any of that innovative? Absolutely not! So, what problem did I face today? Well! I was trying to download a few files from a site (a stock market in India, which we will not name here) using wget, but, wget failed to get them and in stead gave me “HTTP error code 403 forbidden” error message. $ wget -U Firefox "URL of file to download"
The “-U Firefox” helps wget announce itself as the “Firefox browser”. That may seem like cheating, but, its not. It is the site that is incorrectly coded. Bottom line: wget is one fantastic utility.